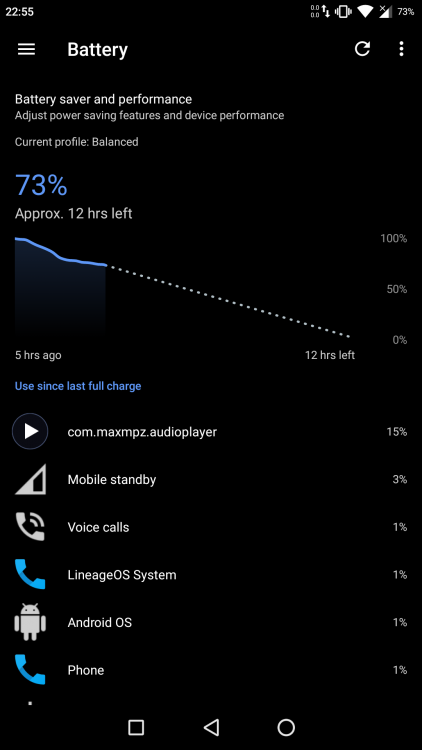 I'm experiencing high battery usage by Poweramp. Ok, what was your usage scenario for these 2 hours of PA? Was that background playback, foreground playback, playback on speaker, 3.5 output, BT, chromecast? Hi-Res output? Each PA release is tested for long background playback (12-16 hours) and there is no any changes (as there were no any changes in audio code, which is quite optimized). As for foreground usage (when Poweramp is playing) visualizations may be quite consuming and overal consuption may be higher. Was this a singular event or does it happen regularly ? Unfortunatelly, I can’t reproduce this issue on my devices. Try to check may be something invokes constant rescans? You can see if scan is happening while in Library (progress animation in the header). Started noticing this Monday (did not use Poweramp on the weekend). Was listening on wired earphones with my screen turned off and noticed the phone was very hot and using a lot of battery. I even got a notification from my phone saying that Poweramp was overloading the CPU and I should close it. Since then, it's been happening all week. Most noticeable when I have it left on my desk while using earphones, because when I go to pick it up it feels very hot. Thanks for the details. I'm currently testing 821 vs 823 battery performance on the reported phones - though this will take time. The "overloading cpu" notification unfortunately doesn't mean anything (it may be shown for any background service). Do you use Wear watch? Also, to exclude hacked version, can you please PM me your google account. Thanks! No I don't use wear watch. Also regarding the notification, as far as I can remember, I have never seen it pop up before for any application until this week, when it popped up twice for Poweramp, so something funny must be going on there. I have also PM'd you my google account. I should also point out that in my picture above for the inital drop from 100% battery, I was using Poweramp while browsing my phone for about 15 minutes, immediately followed by about 35 minutes of Poweramp with the screen off with my phone in my pocket. After that my phone was idled for a couple of hours before I started using Poweramp again which I mentioned in my above post (followed by me charging my phone when I noticed playing music drained so much battery 😢 ). I also restarted my phone a couple days ago when I first noticed this, but it clearly didn't help. While I can’t reproduce the issue on my devices - at least in playing scenarios, I continue to investigate. May be it’s related to scanning + some rare and hard to reproduce setup. I guess you use some sd card with music, right? Thanks for the details. Yesterday I turned of auto scan. Today the battery consumption is lesser than yesterday, but higher than normal (like in earlier versions). All my music is on an sd card (Poweramp has no folders selected from my internal storage). Same issue, with power consumption fairly normal (compared to v2) while the player is in use, but it remains running in the background when disconnected. 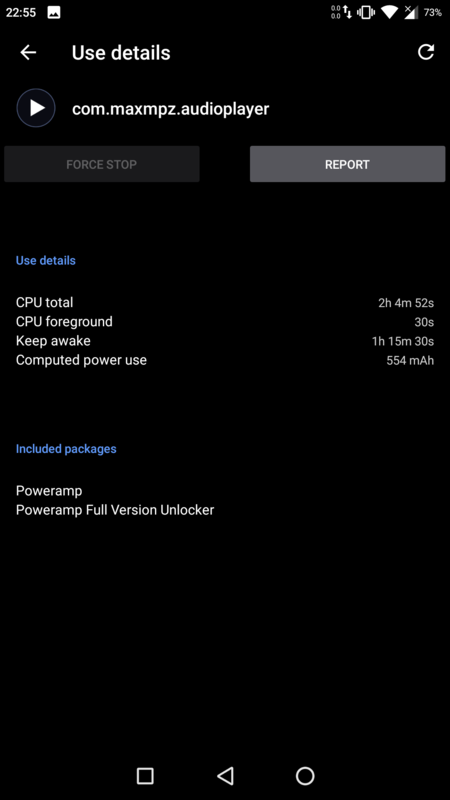 I have the setting to remain available turned off in Settings, but when I see that my battery has dropped more than expected, a quick check of the apps using the most battery shows the player still active. I can stop the player at that point, or simply restart my phone, but it's been happening consistently since I received the last update to build 823. Also as others have mentioned, the phone is abnormally warm in these instances, though in an area away from the battery. Getting high battery usage from Poweramp on my Samsung Galaxy S10 as well. The phone also gets hot. Same issue today. After seeing it happen today I thought of a possible theory. It seems to always happen in the same scenario, which is when I leave it playing on my desk, but it doesn't happen when I am travelling to/from work. The only difference in usage I can think of between these two scenarios is that when I leave it playing on my desk, I sometimes pause it if I have to get up to do something (usually using my built-in earphone controls), while when travelling to/from work I have it playing constantly for the whole journey. It's not reproducible on my devices (100+ devices in test lab). Investigation shows the most probable cause - some other app generates filesystem changes, which trigger Poweramp rescanning. Though, on Android 8+ scans don't happen at all if Poweramp is not playing/open or recently used (~1min). Try to disable Auto-Scan option in Settings / Library / Scanner and see what happens. @qwqwas1122 Do you have chromecast(s) in your network at work (Poweramp shows cast icon)? Thanks! All of my music files are on an sd card, and I always play them through bluetooth. Uninstalling and reinstalling Poweramp didn't help. 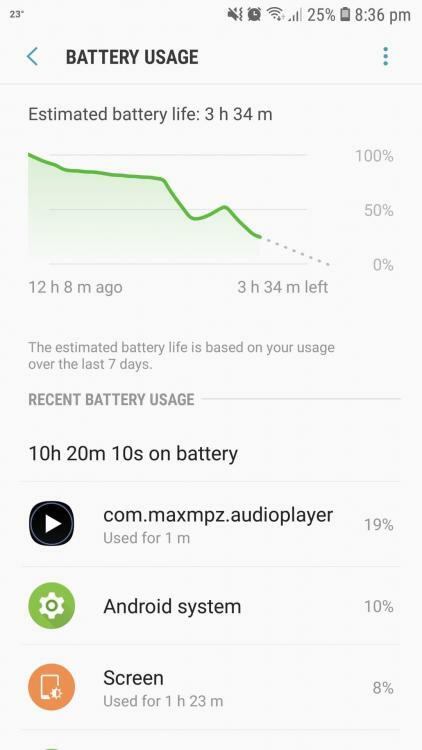 Force-stopping the app brings battery consumption back to normal but it goes back up whenever the app is open, even when not playing anything. Turning auto-scan off didn't help either. Downgrading to build 820 "fixed" it for me. I see the same problem on my OnePlus 6 with Android 9. I have 18 GB of music on internal storage, and after installing the latest update it's eaten through battery several times faster than before. (for example, I would typically have > 70% of my battery remaining after listening to music at work, and yesterday I had ~30% remaining without any change in behavior) The phone also gets very warm during playback. I'm not aware of any chromecasts on my network, but I am connected to my work network so I wonder if there's some network situations that trigger the problem if it is related to the chromecast feature. I have turned off auto scan many days ago. But today after listening to music for like ~1.5hrs, i forced kill the app. Since then I have not noticed any significant battery drain.